Then for the project they first had to count eight yellow paper squares and eight blue ones. 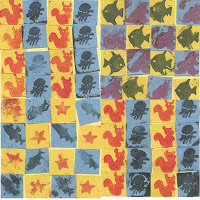 They then stamped onto the squares and they finally glued them into grid patterns on larger squares of cardstock. This is the type of project that I think I would have shunned in the past. The kids had to follow strict instructions and there wasn't a lot of room for individual creativity. But now I think it's really important to have a project like this once in a while. The kids really had to concentrate to count the right number of squares, and make sure that they were stamping the right shape, in the right color. They loved the project, almost 100%, which is really rare. They were delighted when their patterns developed across and down. And the teachers liked it, which is nice. This picture is actually four panels together.